In the lead up to the Annual User Conference (Registration is free here), Earth Science Associates will be introducing the components of another Add-on to GOM3, the Business Planning Add-on. Like the Geophysical Add-on, the Business Planning Add-on has been designed as an addition to add exclusive new features without raising the price of the base GOM3 subscription. 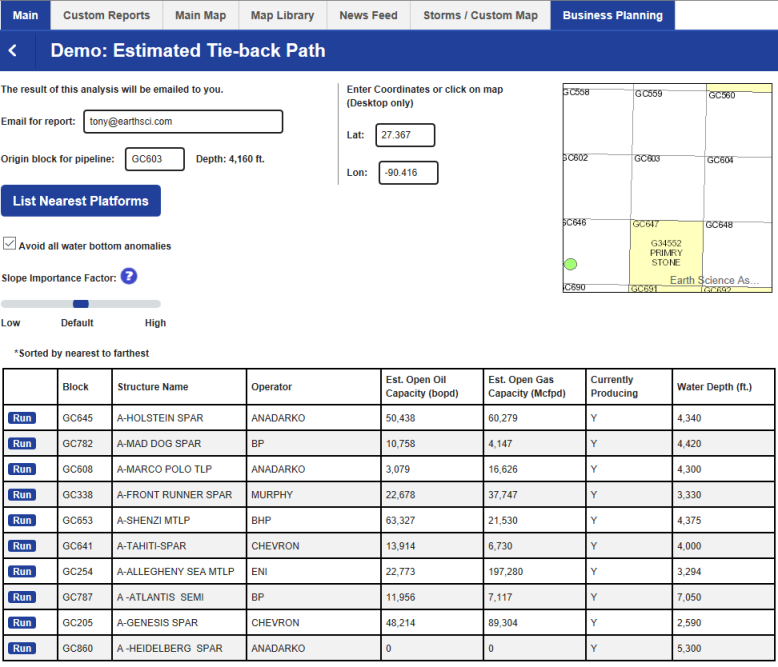 The Business Planning Add-on will feature statistical and geographic analysis in a variety of ways. The first component that will be detailed is the Tie-back tool. This tool calculates the optimal route to tie a subsea well back to a chosen platform using the slope of the seafloor while avoiding seafloor anomalies. This allows someone to quickly run various scenarios with a high degree of accuracy even before pipeline surveys occur. The tool begins by entering an area and block number, such as GC432 as shown above. The starting point of the route can be adjusted to be more specific, either by entering different coordinates or by clicking the map. The importance of the slope (versus the distance) can be adjusted as well. The checkbox indicates that water bottom anomalies will be avoided by default. 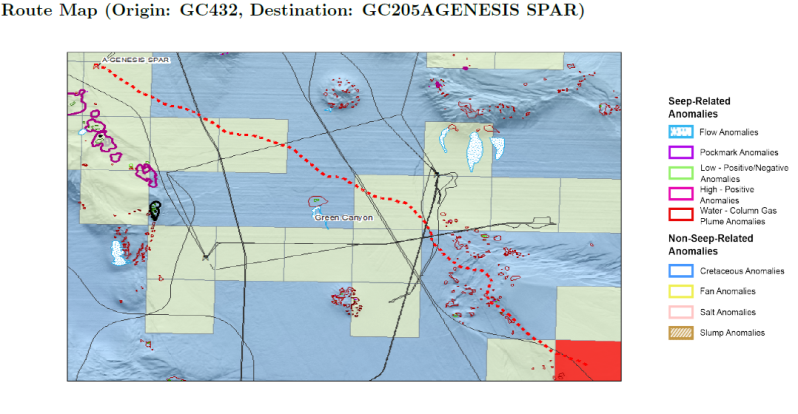 Once the block is entered, the ten closest platforms (within 75 miles) are listed, as are the water depths and estimated open capacity for both oil and gas. The estimated capacity is calculated as the difference between the maximum recorded production of the platform versus the production of the last twelve months. While it is possible that there is more capacity than is listed, it is quite clear that there is at least that much open capacity. Analyses can be run for each platform listed individually. This process will generate a report, CSV files of the coordinates of the route and a shapefile to load into ArcGIS. The report also displays statistics comparing that route to the average slope, max slope, length and slope variability of all pipelines in the Gulf. The full package is sent in an email in just a few minutes. This sample report can be downloaded here but from now until Jan. 12, 2018, everyone logged in to GOMsmart will be able to try out the Tie-back tool in the Business Planning tab. If you need a password to log in or would like to give us feedback, please contact us at contactesa@earthsci.com. Look for the next component in an upcoming newsletter soon and register for the conference for more information.